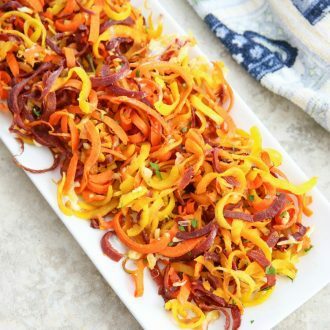 Carrots are spiralized, tossed with a simple herb and cheese blend and then roasted for a few minutes to create a very simple and delicious vegetable dish. Here is my latest spiralized vegetable creation. I’m obsessed with rainbow carrots and I really like how they look all mixed together like this. 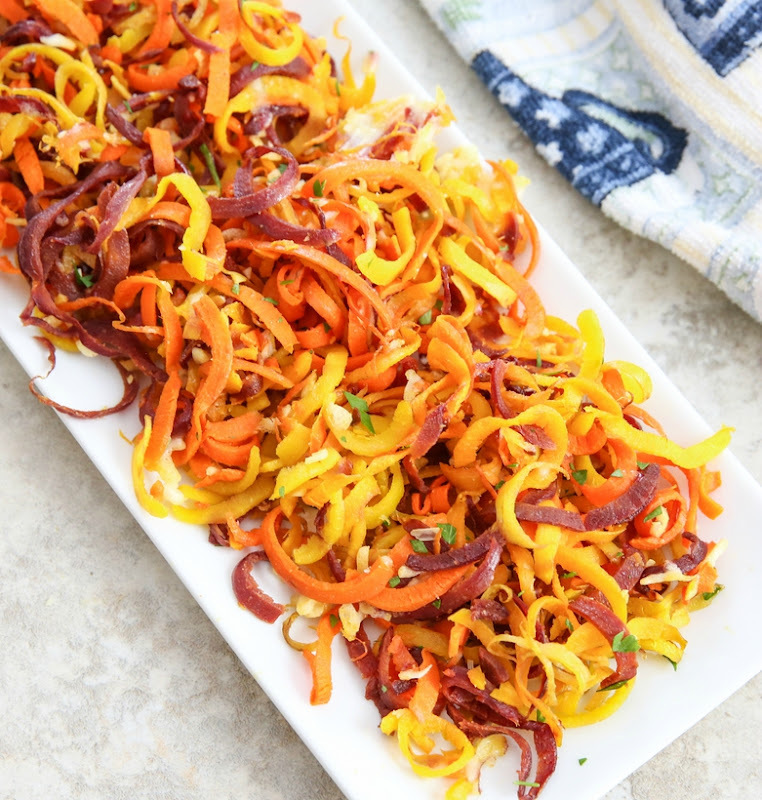 The carrots were easy to spiralize, though they don’t come out in as long of strands as the zucchini and cucumbers. Some come out in long strands and some come out in short curls, but the curls are quite pretty. This week I signed myself up for a Snapchat account (username: kirbiecravings). Then, I spent nearly two hours reading articles on how to actually use Snapchat. All these new social media avenues make me feel really old and out of it and Snapchat is particularly frustrating. That little ghost is just dancing around and taunting me. I haven’t posted any videos yet, but I have made it my goal to do so sometime this week. Let’s just hope I don’t accidentally post anything embarrassing. I’m not really good at jumping on trends. Look how long it took me to start spiralizing vegetables. But I’m so glad I finally discovered it so maybe I’ll feel the same about Snapchat. I’ve discussed this before, but I purchased the iperfect kitchen hand-held vegetable spiralizer*. It’s cheap, easy to use and painless to clean. It comes with a little brush that lets you to easily get the vegetable bits off of the blades. My current vegetable noodle recipes so far include: Skinny Bang Bang Zucchini Noodles, Sesame Cucumber Noodles, and One Pot Zucchini Noodles. 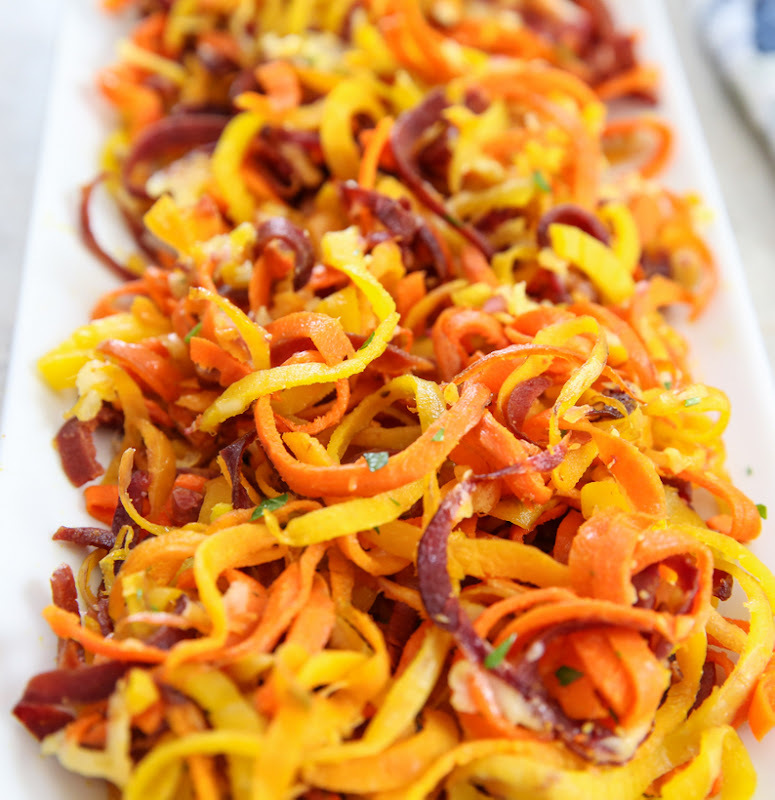 Spiralized carrots tossed with a simple herb and cheese blend and roasted just until they're tender. I like to use different colored carrots for a pretty presentation. 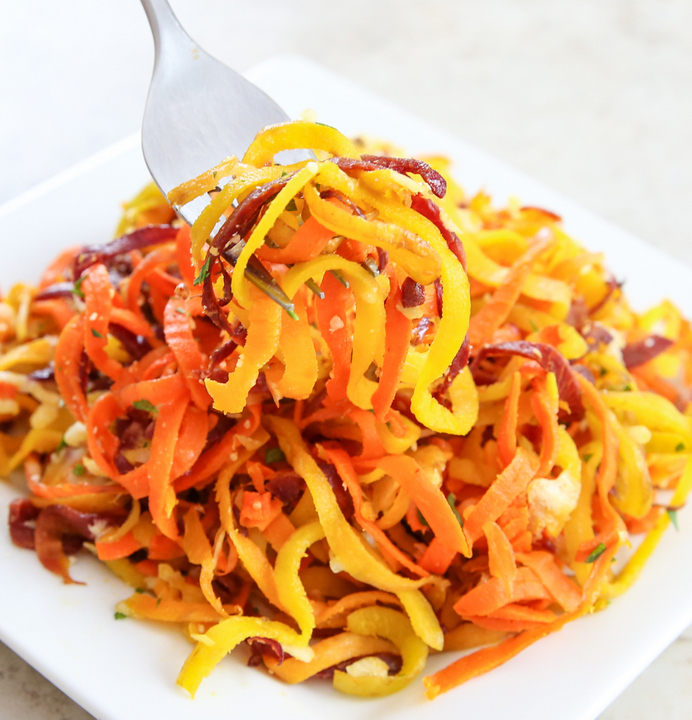 Spiralize your carrots. 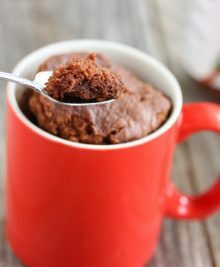 Place into a medium sized bowl and set aside. In a small bowl mix oil, garlic, and onion powder. Add mix and cheese to carrots and toss until carrot noodles are evenly coated. Spread carrots across a baking sheet. Try to keep the carrots to a single, evenly spread out layer. The noodles can overlap a little but you don't want huge clumps. Roast for about 8-10 minutes or until carrots are cooked but still slightly crisp. Garnish with additional parmesan cheese and parsley if desired. Serve while warm. 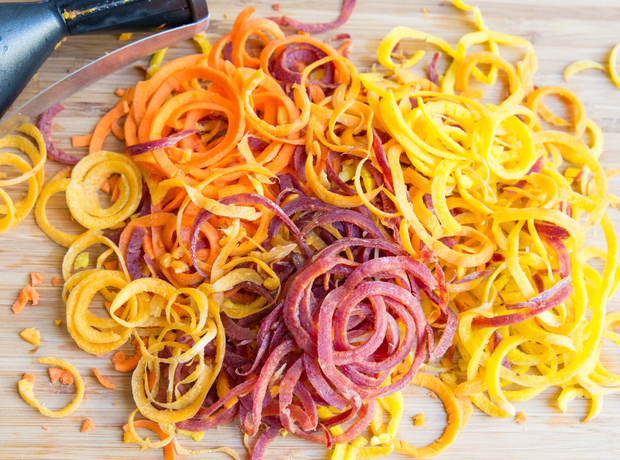 Now I really want to get a vegetable spiralizer! Those rainbow carrots look so beautiful. As for Snapchat, TC has an account (so does Bert, so he can receive what she sends out). The premise of only seeing something for a few seconds frustrates me. The teens seem to love it. It’s too ephemeral for me. I totally feel old since I don’t use social media at all, haha. This looks so incredibly good! I eat so many carrots raw, although I think they’re most delicious from the oven. I’ll absolutely have to make this next time I buy a bag. I’m like that too– I usually eat my carrots raw, but I really enjoy them roasted! 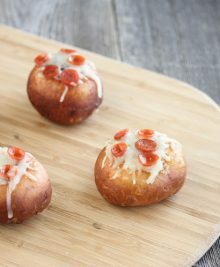 These look so delicious, I think I could eat a whole plate of them right now! Made this for dinner tonight. The carrots were outstanding, but I did make one small change. I omitted the cheese and added 1 teaspoon of fresh grated ginger, and 1 teaspoon dark brown sugar. Served as a side dish with roasted chicken and green beans. YUM YUM!!! so glad you liked them! hmm, i like the idea of ginger and brown sugar! These carrots look delicious. 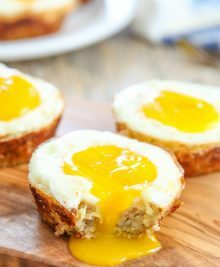 I have question about when to add the cheese. Should I add the cheese before roasting the carrots or after?